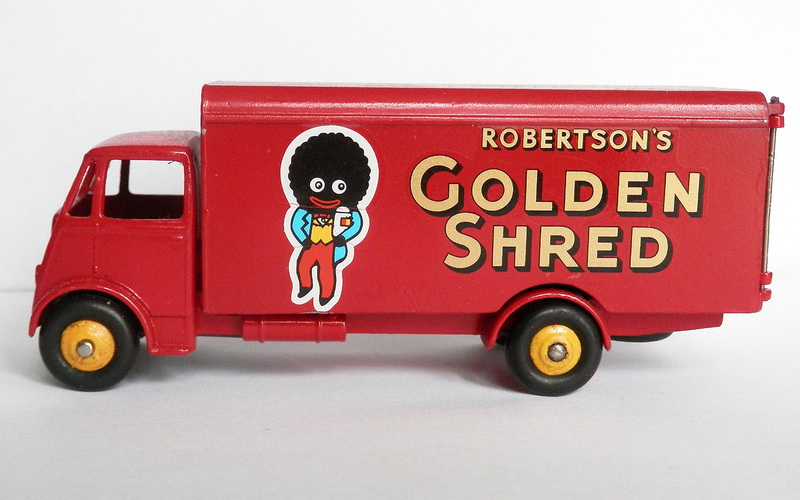 The final version of the Guy vans was issued in June 1957 in 'Golden Shred' livery, Robertson´s famous marmalade product, with the logo in the form of a black doll, the then very popular 'Golliwog'. 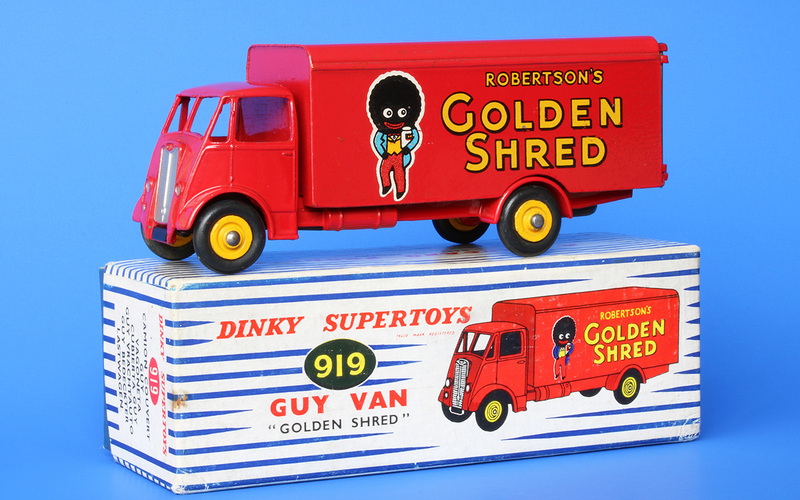 The late 'Golden Shred' is the only one of the six vans that was exclusively equipped with the second type of cab and the only one that had the brand name Dinky Supertoys in italics on the box. 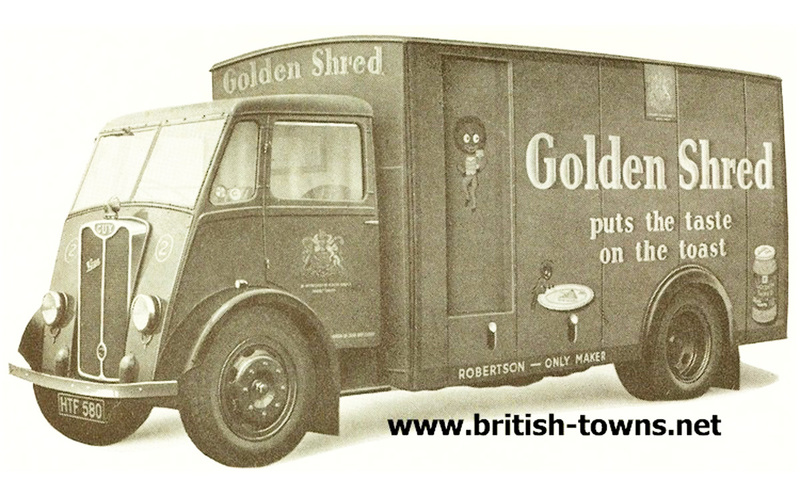 Issued post-1954 the 'Golden Shred' van is one of the two (together with the 'Ever Ready') Guy vans which have only ever been allocated a modern 900 number. 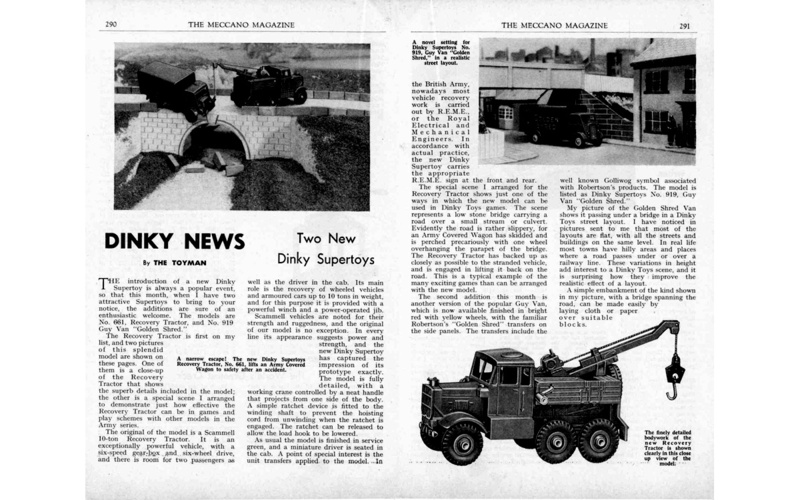 Both are only known as Dinky Supertoys and also only packed in the familiar blue striped lid box. 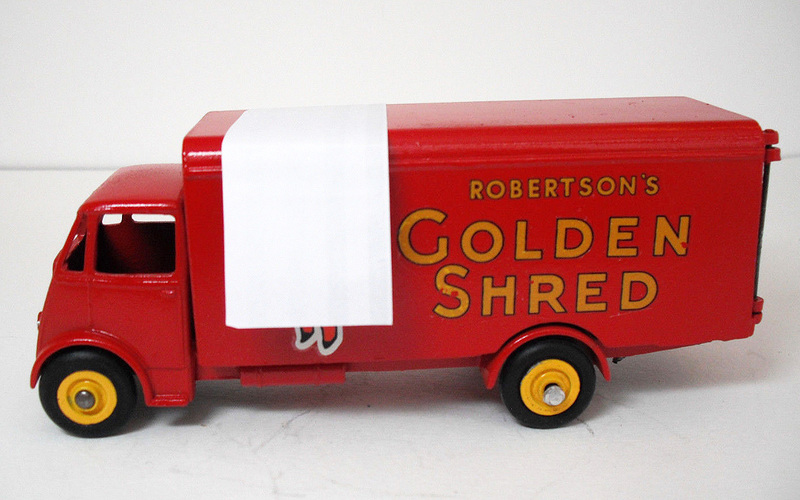 However, the ‘Golden Shred’ is considerably scarcer than the 'Ever Ready' van, that was included in the catalogs from 1955 to 1958. Despite its availability in the years 1957-1958 we will never find the 'Golden Shred' with threaded tyres, which were introduced in the course of 1957. These are only and exclusively found on the various Guy Warrior models. After all, these were issued one year later, in 1958. 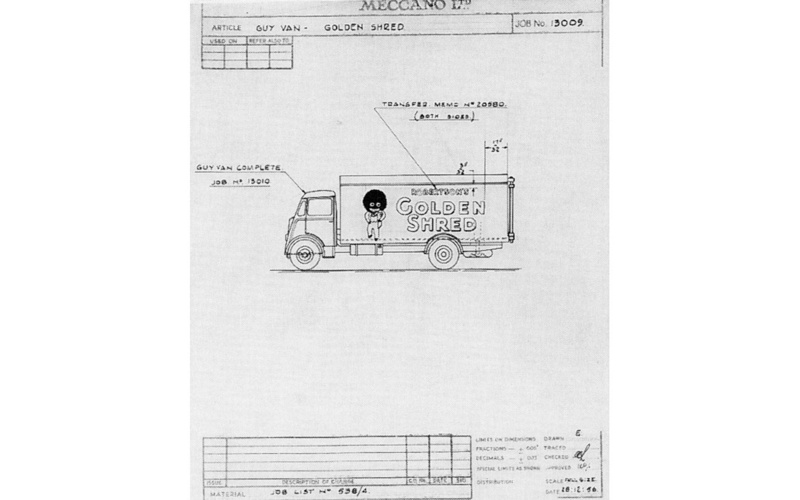 The 'Golden Shred' van was introduced on the threshold of the transition from Guy Vixen to Guy Warrior models. 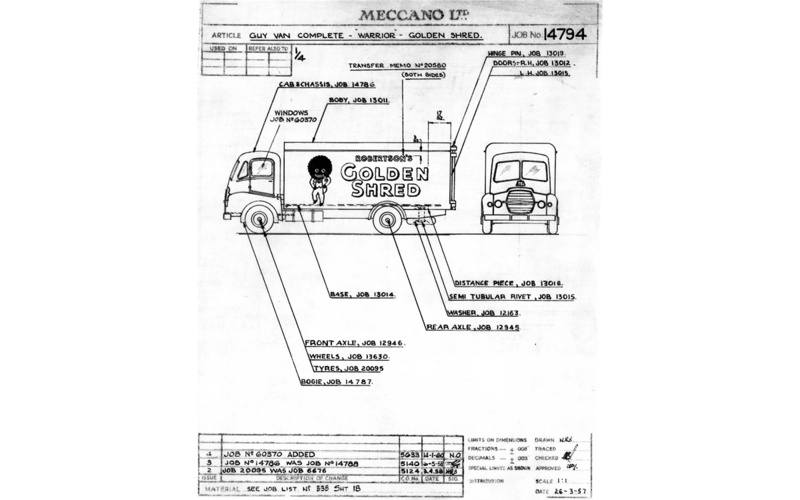 An assembly drawing of this livery with Guy Warrior cab is therefore the only one known of this ‘Golden Shred’version. A nice image of it was in Classic Toys 2-8 from November-December 1995. A model was never issued and the only van based on a Guy Warrior chassis appeared (and quickly disappeared) in 1960, using the new transfers (with ketchup bottle) for the chronologically overlapping Big Bedford Van 'Heinz'. Job no. 13009, Guy Van - Golden Shred (assy), dated 28-12-1956. Job no. 13010, Guy Van Plain Van, 514 side elev. (assy), dated 04-10-1948, updated until 08-04-1958, signed D.L.M. Job no. 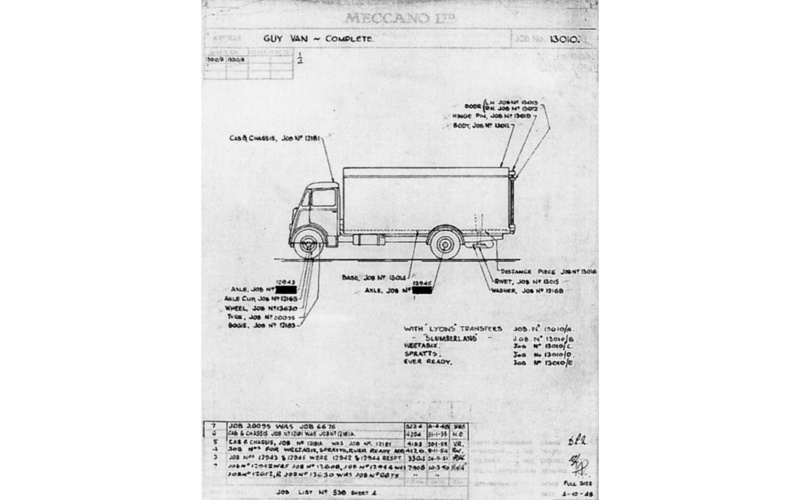 13011, Guy 4-ton Truck Van Body (large), dated 28-01-1948. Job no. 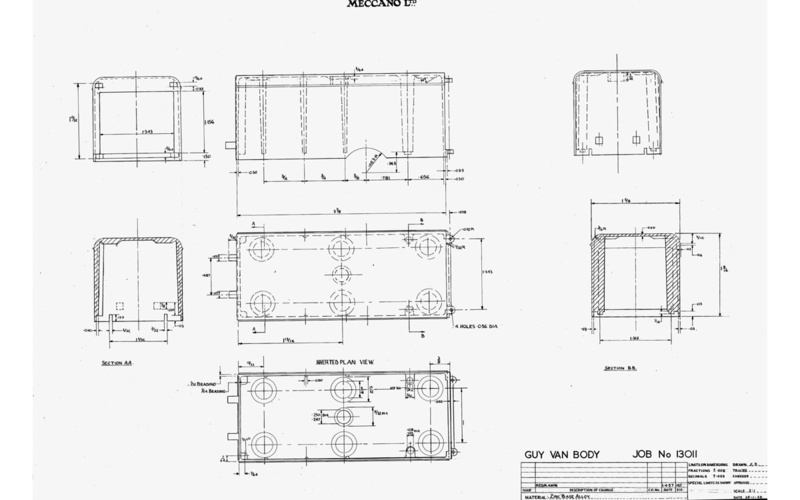 13011, Guy Van Body (large), dated 28-01-1948 (01-04-1957 redrawn). Job no. 13012/3, Doors - Guy Van (small), dated 09-02-1948. Job no. 13014, Base - Guy Van (small), dated 08-04-1948. Job no. 14794, Guy Warrior From 'Golden Shred' (assy), dated March 26, 1957 (not issued). Picture of the (general) no. 13010 complete drawing: Christie's 9/1995 p. 15. Picture of job no. 14794 (Guy Warrior 'Golden Shred') Classic Toys 2-8 p. 55. Pictures (full size) of van body etc on this website: Publications > Documents > Factory Drawings (registered users only). (Sources: Christie's 9/1995 nos. 140, 141, 148, Classic Toys 2-8 1995 p. 55, 59, Richardson GBofDT p. 196, 208). 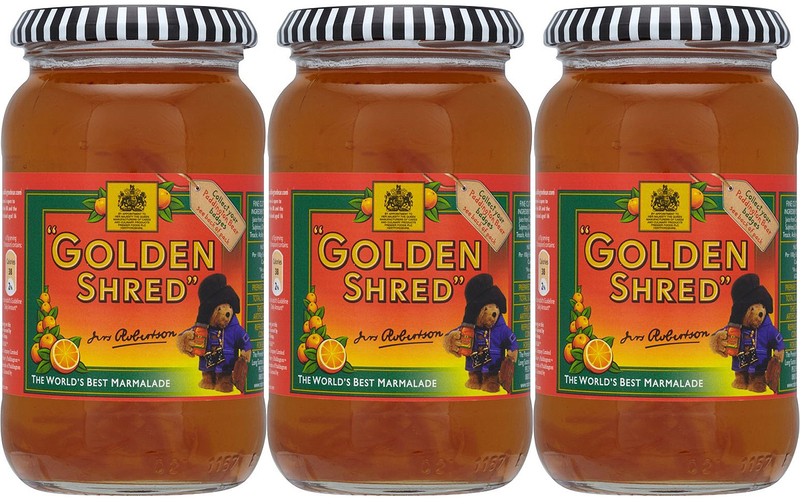 Robertson's ‘Golden Shred’ brand of marmalade and fruit preserves was created in 1864 by James Robertson (1832-1914). The couple Robertson-McFadyen invented the recipe where the bitter taste of the orange could be reduced, while their marmalade retained the 'highly tonic value of the fruit'. The origin of the Golliwog as a logo is described by wikipedia as follows: 'Just before World War I, John Robertson (son of James Robertson) was on a tour of the United States. Whilst on a visit to the backwoods he noticed many young children playing with little black rag dolls with white eyes, made from their mothers' discarded black skirts and white blouses. Intrigued by the popularity of the ‘Golly’ (the name being the children's interpretation of doll), he thought it would make an ideal mascot and trade mark for the Robertson's range of products. Accepted by the company, Golly was first shown on Robertson literature in 1910, on items such as labels and price lists'. The image of the doll has become the subject of controversy nowadays. Under the influence of social changes in the past few decades the use of the Golliwog figure came under attack. 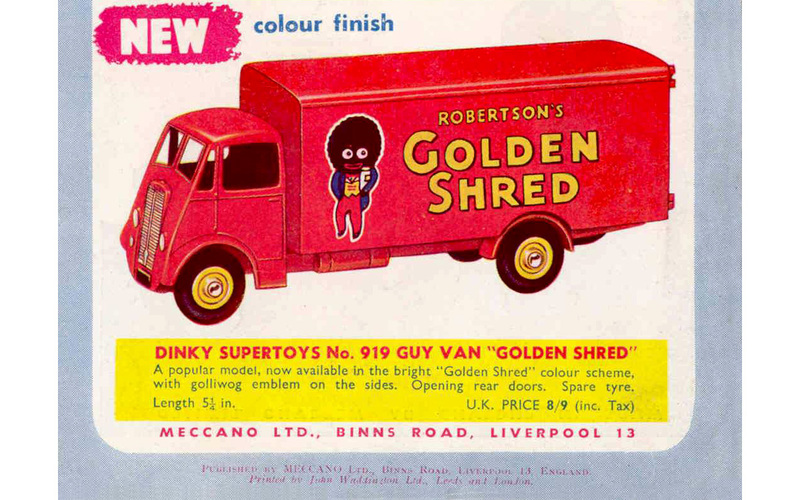 Whereas especially in the United Kingdom the Golliwog had become (and still is) a very popular collector's item in all sorts of forms, Robertson's discontinuation of this well-known trade mark took place in 2002. It has since been replaced by the Paddington Bear, which was not questioned. 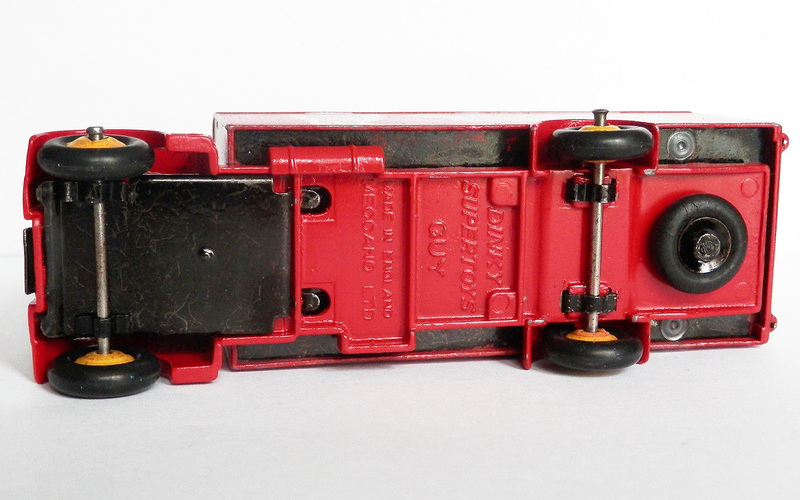 Because of these developments, this beautiful and popular last Guy Vixen van, unintentionally and very regrettably, seems to have become a sort of 'guilty' Dinky Toy as more than once, on eBay and on other internet sites, we suddenly find a ‘Golden Shred’ model of which the Golliwog logo is hidden from view nowadays. Jan—-Thanks for providing another wonderful history of a classic Guy van. To me, the Golden Shred is the best of the later Guy Vans, with striking color and livery.....it really stands out. It is too bad we do not know actual production numbers, as this version is much less common that the Eveready. As it was so attractive, one would tend to wonder why? To me, this series of Guys Vans, made over a period of many years, is such a wonderful series for ardent Dinky Toys collectors, and getting tougher to complete. Yes, thanks for the writeup! Not only is this version uncommon, but I'd think that the presence of the "Golly" also makes it unlikely that Mattel/Atlas/DeAgostini will produce a replica. Dan Toys did release one, however. Thanks for this fine contribution on the Golden shred. As usual very interesting. This keeps our hobby alive.